The Congressional Budget Office said Wednesday that the Treasury Department will likely run out of its extraordinary measures, and thus run out of cash, during the first half of March…. That’s as much as a month earlier than CBO previously projected, and the scorekeeper said it was pretty clear that the new $1.5 trillion tax cut was a big reason for the change. All the high-fiving among Republicans over the tax bill didn’t quite take into account that the fiscal damage it wrought wasn’t just long-term, but short-term as well, with revenues dropping almost immediately. But what makes the situation so dangerous is that earlier efforts to keep the debt-limit and government-spending votes separate could be all for naught as the former accelerates and the latter keeps getting put off. And the already difficult negotiations over immigration and defense and nondefense spending levels could suddenly get tied into the possibility of an economically ruinous debt default. “I’ve had conversations as recently as yesterday with Director Mulvaney and as recent as last week with Secretary Mnuchin on the debt ceiling, on how we can effectively make some real reforms in that area,” he said, referring to White House budget director Mick Mulvaney and Treasury Secretary Steven Mnuchin. It’s unclear what kind of “reforms” Meadows has in mind. He’s unlikely to get what he and his caucus really want, which is an attack on “entitlements” such as Medicare and Medicaid. Both Mitch McConnell and the administration seem to have ruled those out for this year. 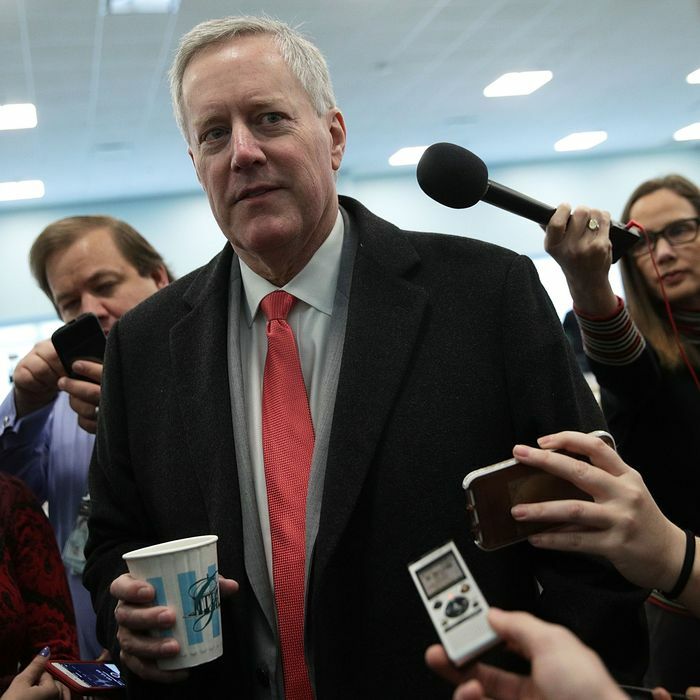 But the other thing House conservatives have been asking for recently is to de-link the defense-spending increases they want from similar increases in nondefense spending, which normally stroll together hand in hand through Congress when the appropriations caps enacted in 2013 are breached. It’s bad enough that HFC members are threatening to vote against the next stopgap spending bill without this demand being met. If a debt default is added to a potential second government shutdown as leverage, these hard-liners could become giddy with power, and everything could get out of hand. In general, despite its “must-pass” label, a debt-limit vote can make any congressional impasse much worse and possibly catastrophic. Given the splotchy record of the administration and the GOP Congress in the spending negotiations that have dragged on since well before the current fiscal year began last October, that’s not good news.